HB Alex Collins vs. LB Vince Williams – Collins has been running well as of late and now has a run grade of 83.7 on the season, good for ninth among running backs. Williams ranks middle of the pack in run-defense grade (63.3) for linebackers, and with fellow LB Ryan Shazier out, Williams may have to fill a larger role this week. Williams has missed five tackles in run defense, tied for 15th-most among linebackers, while Collins has forced 25 missed tackles on the ground, tied for 11th-most among running backs. WR Mike Wallace vs. CB Artie Burns – Wallace continued his solid play in the second half of the season with 116 receiving yards last week, catching two of three passes traveling 20-plus yards downfield (deep passes). Wallace has reeled in six of 14 deep targets (42.9 percent catch rate ranks 18th) and sees a deep pass on 24.6 percent of his targets. Burns has been targeted on deep passes 17 times this season (tied for sixth-most), though he’s allowed just four receptions. C Ryan Jensen vs. DI Javon Hargrave – While Jensen has been solid in the run game this season, his weakness lies in pass blocking, while Hargrave has been effective rushing the passer. Jensen has allowed three sacks this year, tied for third-most by a center, though he is coming off his highest-graded pass-blocking game of the season. Hargrave’s pass-rush grade of 77.3 is tied for 32nd of 110 interior defenders, but he has accumulated just one pressure (a lone hurry last week) over his last four games. With Jensen’s recent success and Hargrave’s recent struggles in the passing game, this will be an intriguing matchup to watch. RB Le’Veon Bell vs. LB C.J. 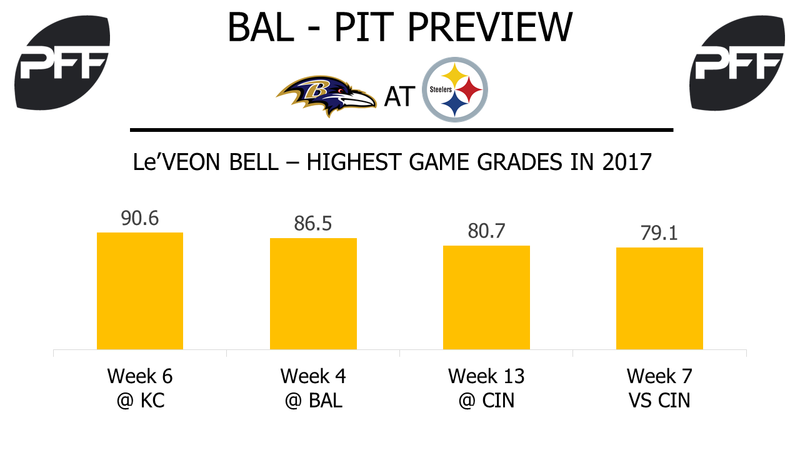 Mosley – Bell will be looking to repeat his Week 6 performance against the Ravens, as he earned his second-highest game grade of the season with an 86.5. In that game, Bell forced 10 missed tackles on the ground and earned 4.19 yards after contact per attempt. But Mosley racked up 10 run stops in that same game to go along with his 14 tackles in the run game, the most by an inside linebacker in a game this season. While Bell hasn’t been as productive a receiver as in the past, he has been targeted 30 times in the past three weeks with 123 snaps in route. That would rank him fourth among wide receivers in the league over that span. Mosley, on the other hand, has been in coverage for 386 snaps this season, which is the seventh-most by an inside linebacker. WR Martavis Bryant vs. CB Brandon Carr – With the suspension of JuJu Smith-Schuster, Bryant will be asked to have a bigger role in the Week 14 matchup with the Ravens. When Smith-Schuster was sidelined in Week 12, Bryant played 79.7 percent of snaps, which is his second-highest percentage of the season behind only Week 1. Bryant’s average depth of target is 16.3 yards downfield this season, but he has only made two receptions of 20 yards or more downfield. That’s compared to the 15 deep receptions Bryant made from 2014-15. Carr has allowed two touchdowns and a passer rating of 87.9 on deep passes this season. Those two touchdowns are 67 percent of the touchdowns allowed by Ravens’ cornerbacks in 2017. T Chris Hubbard vs. Edge Matthew Judon – While starting in place of the suspended Marcus Gilbert, Hubbard has held his own against some of the best pass-rushers in the league. In the past two weeks, he has faced Clay Matthews and Carlos Dunlap, who have a combined 12 sacks and 67 pressures from the right side of the offensive line. Hubbard has only allowed Ben Roethlisberger to be hit once in the past two weeks on 90 pass-blocking snaps in that span. Lining up on the other side is Judon, who has the highest sack percentage (35 percent) in the league among 3-4 outside linebackers.